Salzburg City is the capital of an Austrian province or state of the same name. Whilst the city has a population of approximately 150,000, the state come with some 530,000 residents. This article is a very quick overview on what Salzburg is and where you can spend what sort of vacation. For details on the travel destinations, there are links to further articles. The state of Salzburg is arranged into six administrative entities or counties (Bezirke), mostly named after the county town: Salzburg City, Salzburg-Umgebung, Hallein, St. Johann, Zell am See and Tamsweg. 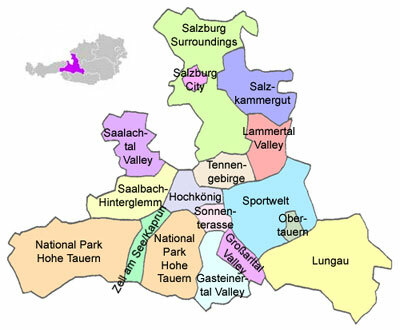 These correspond exactly with the traditional names for the regions in Salzburg, which are still used by the locals (Flachgau, Tennengau, Pongau, Pinzgau and Lungau - the term "Gau" referring to an area). Salzburg is very mountainous in the south and hilly in the north. All of the state is very touristy, but the tourism hubs are the city (all year round) and the ski resorts in the Pongau and Pinzgau areas (bi-seasonal in winter and summer, but clear bias to the skiing season). There are three major rivers in Salzburg: The Saalach, the Mur (in the Lungau, which is culturally and geographically closer to Carinthia) and the Salzach. The latter one is the most important river and forms the main valley along which most of Salzburg state extends. Most people live in the hilly north of Salzburg, within reach of the city, as well as in the Salzach Valley. In the south, tourism is the main economic driving force; in the north, the economy is generally more diverse. Much of the southern Alpine areas are part of the Nationalpark Hohe Tauern. Many skiing areas in Salzburg are part of the Ski Amade association; some hubs such as Obertauern, Saalbach-Hinterglemm or Zell am See / Kaprun are strong enough to stand alone and do so. The best skiing areas can be found in the stretch of land north of the national park and south of Werfen. During the summer, the vast hotel settlements are often not fully booked and you can get a bargain deal for hiking and spa holidays. The thermal springs of the Gasteinertal Valley are particularly nice for that. For further details, read the articles on the administrative regions (linked above) or continue with the two short articles on Salzburg′s north and Salzburg′s south. You can also go directly to articles on the individual travel destinations or read on individual municipalities.